In the first ever defense of the UFC flyweight belt Demetrious Johnson defeated Albuquerque’s John Dodson via unanimous decision in a very competitive contest. 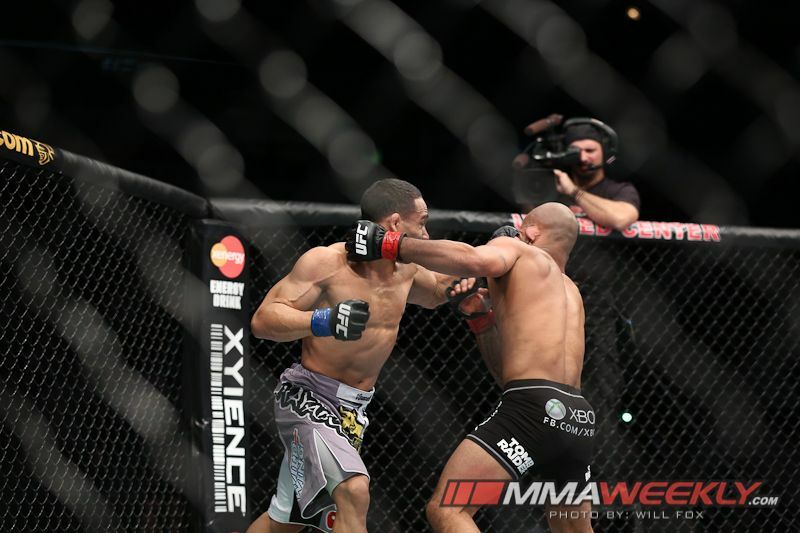 most significant strikes of the entire contest landed, as Dodson would be able to drop “Might Mouse” twice with hooks. Surprisingly, Dodson would not seek to pursue Johnson, who showed he was in great shape, immediately standing and recovering once going down to the canvass. A close round in the third frame would be tainted by an apparent unintentional low blow to Dodson, interrupting the rhythm he had built in the previous round. After a small break in the action to give Dodson a chance to recover, the champion would set the tone for the rest of the contest by keeping the distance with leg kicks and constantly coming forward forcing Dodson to retreat. This allowed Johnson to set up takedown attempts and prevented Dodson from positioning himself to throw big punches. defense in UFC. That flawless statistic would be put to an end against Johnson, as the flyweight champion was able to take down the challenger in five out 15 attempts. He was successful with at least one takedown in every round. In the fourth round, Johnson would do the most damage by outstriking Dodson 52 to 12. 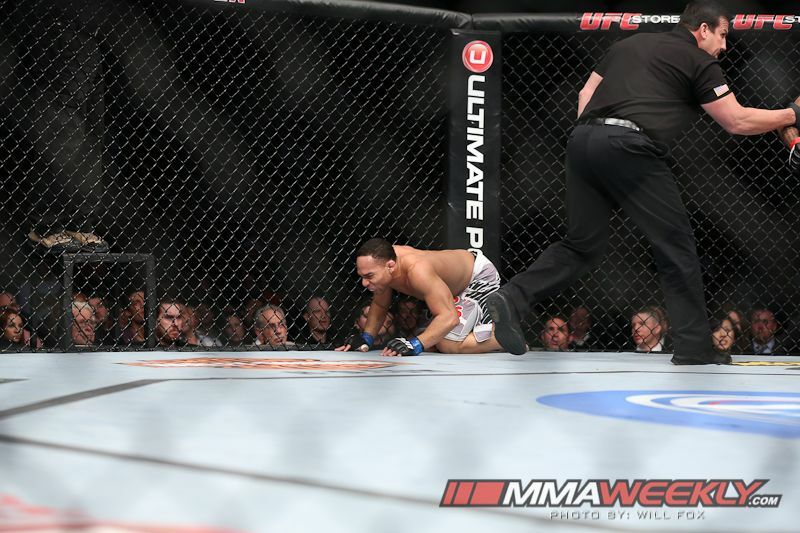 Another significant illegal hit came in a version of a knee while against the cage, a hunched over Dodson would place his hand on the ground and receive two knees to the head as Johnson clinched him. This forced referee John McCarthy to once again stop the action to warn Johnson once again for illegal blows. A point was not deducted from Johnson for either hit. A mouse would produce itself over Dodson left eye forcing ringside physicians to check on him. From that point on he was not the same fighter he was earlier in the contest. The final round would be dominated by Johnson whose Thai-clinch allowed him to land a barrage of lethal knees to Dodson’s face. The round weighed heavily in favor of the champion who according to FightMetric landed 50 significant strikes to the challengers nine. The judges all had the contest as a unanimous for Johnson 47-46 twice and 49-46. December 12, 2009 – B.J. Penn def. 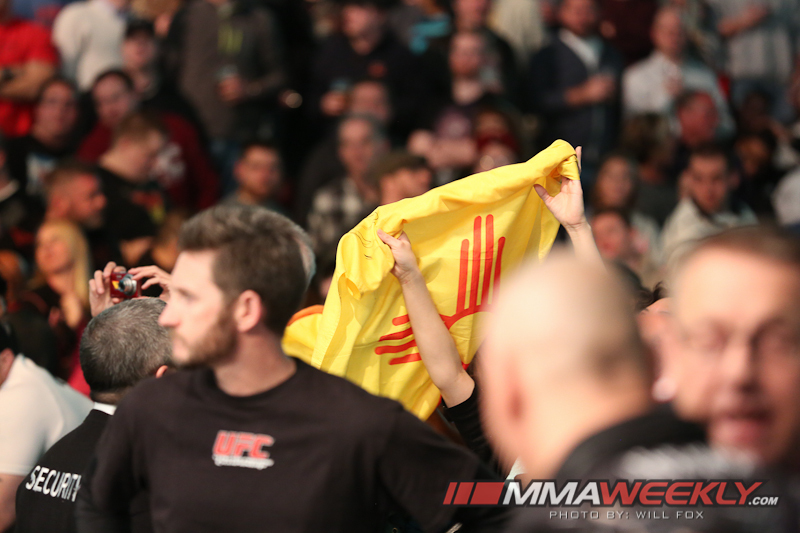 Diego Sanchez Albuquerque, NM via TKO to retain UFC Lightweight title at the FedExForum in Memphis, TN. February 4, 2012 – Carlos Condit of Albuquerque, NM def. Nick Diaz via unanimous decision for UFC Interim Welterweight title at the Mandalay Bay Events Center in Las Vegas, NV. November 17, 2012– Georges St. Pierre def. Carlos Condit via unanimous decision unify the UFC Welterweight title at the Bell Centre in Montreal, Canada. January 26, 2013 – Demetrious Johnson def. John Dodson of Albuquerque, NM via unanimous decision for the UFC Flyweight title at the United Center in Chicago, IL.